I had lunch with French economist Charles Gave not long ago. Nearly 40 years ago – when he was “still young and creative” – Gave described what he called the “Four Quadrants Framework” for figuring out where we are… and what we, as investors, should do. Like a map, the financial world can be divided into North, South, East, and West. Each place has its threats and opportunities; but in order to get where you want to go, you have to first know where you are. Prices are either going North or South… and they do so in an economic world that is either moving forward or backward, East or West. I have adapted Gave’s model in a way that must surely make him cringe… but it should help us understand and may provide useful bearings for our onward journey. Each quadrant has its own investment formula. If you are in the Northeast Quadrant, for example, with real growth on Main Street as well as Wall Street, you buy quality stocks. You do not want to hold cash or bonds. If you are in the Southeast Quadrant – with a growing economy, but declining prices – you want to own mostly high-quality bonds, with a mix of stocks (companies with pricing power) and cash to hedge your bets. If you are in the Northwest Quadrant, the last things you want to own are bonds or cash. Stick with gold, commodities, and real estate – especially gold. Stocks could put on a nice rally – as people seek to protect themselves from bonds – but since the real economy is shrinking, any performing asset can expect to perform less well. 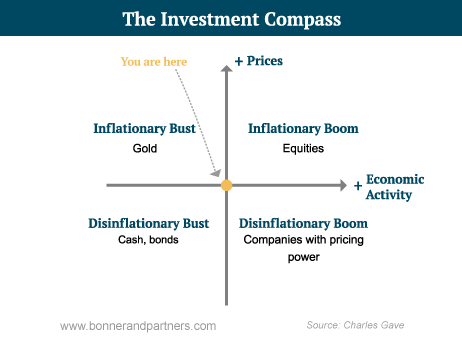 And in the Southwest Quadrant – where I think we are going next – the thing to own is cash… with a light mix of gold, stocks, and Treasury bonds as a hedge. Bill Bonner and Doug Casey have been friends for almost forty years… and they've amassed a combined nine decades in the trenches of independent financial publishing. And yet, despite that lengthy back story, they've never shared the stage in an online summit before. 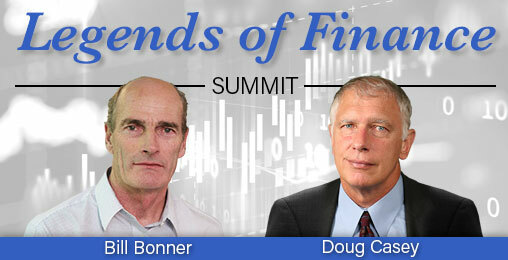 On February 8th, that all changes, because they're featured in the world premiere of the Legends of Finance Summit. During this unprecedented event, they will discuss Bill's bold “Trade of the Century”… plus 6 urgent ways you can play it. A further warning: The Investment Compass suggests a simplicity and precision that don’t actually exist. Rarely do we see a perfect rendering of the quadrants. Instead, there is usually some confusion and ambiguity… with some prices rising, but not all, and some sectors of the economy in good health while others collapse. The idea is to get out your GPS and establish your present location as best you can. And if you don’t know where you are, the best place for money is cash. So that is our main holding. Gold (the ultimate form of cash) is another main holding. Cash is insurance against weirdness. But some forms of cash can be pretty weird, too. What else? How can we position ourselves to take advantage of a return to normalcy? One side of the Trade of the Century would have us betting against that red line (“World Debt”) on the chart from yesterday’s letter. That is, you would short the financial assets that now depend on further increases in credit – stocks and bonds. Just as we seem to have a historic opportunity on the short side, (by “shorting,” or simply shunning government bonds), on the long side, there is one stock market that is so cheap, it alone could be worthy of the Trade of the Century. No stock market has ever been so cheap… and survived. Naturally, when a stock market is this cheap, it must have problems. And those problems are what you hear about. So if you were to mention to your spouse or your financial advisor that you were investing in this stock market, they would immediately tell you that you should seek professional help… from either a certified financial planner or a psychiatrist. Maybe both. And even I will not advise you to buy it. It’s not easy to do. And it certainly is asking for trouble. Only the most intrepid and more adventuresome investors should even consider it. Besides, who will be around in one hundred years to tell me how it worked out? Nobody's talking about it, but an estimated $846 billion mountain of money is expected to hit cryptocurrencies as early as April 2nd. That's more money than the value of every single cryptocurrency on the market—combined. Three small cryptos in particular are expected to see the biggest portions of that cash… Details here. Remember that the Trade of the Century, like the Trades of the Decade, is a learning tool… to help us understand how things work. It is not the same as serious portfolio advice. So, with this caution, guess what stock market is so outrageously cheap… so abnormally, abysmally, absurdly cheap… that it is worthy of the Trade of the Century? I can almost hear the gasps of disbelief. Cyprus is a loser. Its stock market is down 99.986% from its peak in 2007. 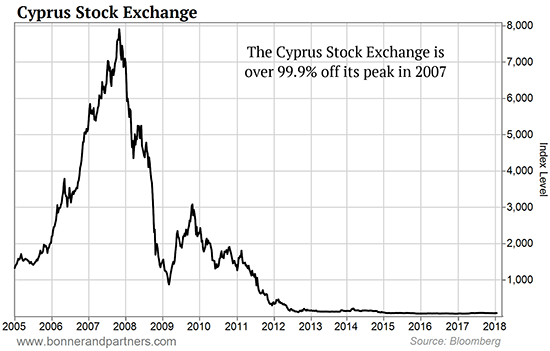 In other words, for every $1,000 you had invested in Cypriot stocks nine years ago, you now have 10 cents. The 2008-2009 crisis hit Cyprus especially hard. GDP is down 28%. Unemployment rose to 11%. Even today, half of corporate loans are non-performing. The chart below is especially instructive. It shows what reversion to the mean looks like. And it tells us, clearly, that there’s no need to worry about excess pricing in Cypriot shares today. This still leaves the question: What should you do with your money now? We are eight years into the second decade of the 21st century. And we are 30 years into the weirdness of central bank-supported asset prices. If the next two decades are like the last three, things will get a lot stranger. Already sky high, stocks and government bonds will go even higher. But betting on more weirdness, after so much abnormality for so long, is risky. Whatever else might be said, waiting for a correction is like waiting for the cable TV installer. He will invariably show up just after you’ve given up on him. Editor’s Note: On Thursday at 8 p.m. ET, we’re hosting one of the biggest events in our firm’s history: The “Legends of Finance Summit.” You’ll hear from Bill, Nick Giambruno, and legendary speculator Doug Casey. Together, they’ll answer the question Bill posed above: What should you do with your money now? To reserve your seat at this free event, click right here. Nick Giambruno’s Note: On Thursday at 8 p.m. ET, we’re hosting one of the biggest events in our firm’s history: The “Legends of Finance Summit.” You’ll hear from Bill, legendary speculator Doug Casey, star analyst Chris Mayer, and me. Together, we’ll dive deeper into the question Bill posed above: What should you do with your money now? As you’ll see, the strategy that led Bill to the Trade of the Century can land you outsized gains in the years ahead… Reserve your spot to this free event right here.